Summers is on the start and so is IPL league 2019. Match 8th has been on its move today with Rajasthan Royals Vs Sunrisers Hyderabad. Both the teams are welcomed to the cultural city Hyderabad with open arms. The city will witness the match and are willing for the win of the home team Sunrisers in Rajiv Gandhi International Stadium at 8:00 PM (IST). Teams have high their spirits and moral for a win. Rajiv Gandhi International Stadium’s pitch is to be considered a dry, flat track and slow scoring and create opportunities for spinners rather than pacers. This pitch doesn’t offer much to the batting line up because it causes much trouble to score a little. The team who wins the toss should elect to bat first rather to bowl. In SRH squad Kane Williamson due to his shoulder injury will still be a doubt to the play against Rajasthan Royals. And in Rajasthan Royals, all looks good and players will remain the same as of the last game. Sunrisers Hyderabad and Rajasthan Royals have been encountered for 9 times in which sunrise Hyderabad have managed to win 5 and Rajasthan Royals are left with 4 matches. 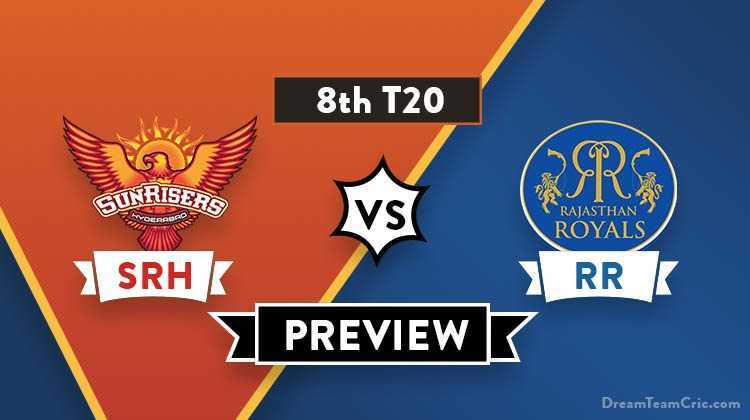 This match will be a decider for both teams either they tie with each other or Sunrisers take the lead. Sunrisers are to be called as “Orange Army” with smashers bowlers of all the IPL seasons. But this season the start was a little rough as they lost their first match to Chennai Super Kings. Rajasthan Royals have to come up with their A team to take the win from Riser’s hand. Bhuvneshwar Kumar©, David Warner, Jonny Bairstow, Vijay Shankar, Manish Pandey, Deepak Hooda, Wriddhiman Saha, Shakib Al Hasan, Rashid Khan, Sandeep Sharma, Siddharth Kaul. Ajinkya Rahane©, Jos Buttler, Steve Smith, Sanju Samson, Ben Stokes, Rahul Tripathi, Krishnappa Gowtham, Jofra Archer, Jaydev Unadkat, Shreyas Gopal, Dhawal Kulkarni.